My aunt KK and I decided that we have always wanted to try a jelly roll quilt sometime. We ended up getting several jelly rolls for Christmas and decided to get together for a day and make a quilt using one. 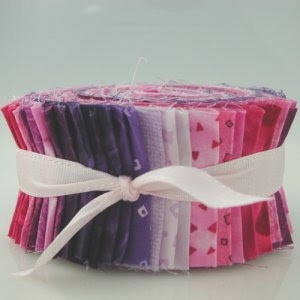 Corey got me this really cute jelly roll for Christmas in pinks and purples (pictured below - image from QuiltersWay.biz) that I decided to use. I also had a cute pattern that I got from Quilters Way in Concord. We decided to get together yesterday to make a quilt using our jelly rolls. 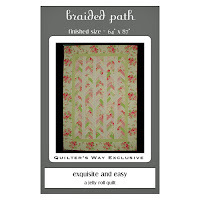 I used a braid pattern I had from Quilters Way in Concord, MA they made especially for jelly rolls. It was a lot of fun working on it. The initial cutting took a while, which was surprising since they were already cut into 2 1/2 inch strips. I had to cut all 40 of the strips into six or seven 6"x 2 1/2" pieces. At lease once I did all that cutting I didn't have to do any more cutting until all of the braids were made. You can see the beginning steps of the quilt below. I have to add sashing in between each braid, the inner border, and the outer border. I'm debating between purple or pink for the border color. We'll see what I decide to do. A few months ago, my aunt (my quilting buddy) and I decided to do our own mystery quilt. We had originally wanted to take a class somewhere but couldn't find any that we really liked, so we decided to do something ourselves. the fabrics if we knew the design. As you can see with the photo below, I would have placed the colors differently, especially the yellow. The inspirational fabric that was given to me was the border. It was a step out of my comfort zone since I usually pick more modern/funky fabrics instead of the flowery, more traditional fabric.